The Irish Kilt is quite different to its Scottish cousin, in that it is normally made from cloth that is one solid colour. Saffron and green being the most widely used. 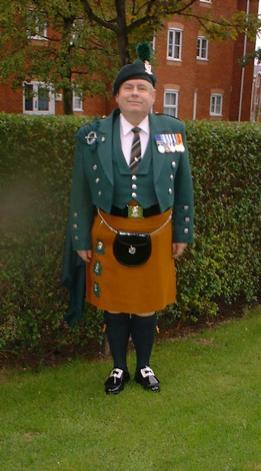 It is virtually undisputed that this particular kilt has its origins in the Scottish Highlands, and was almost certainly introduced to Ireland by the British armed forces. Solid coloured versions were often seen in the 19th and early 20th centuries, especially at political gatherings and music events, being used as a symbol of Gaelic nationalism. Below is a photo very kindly sent to me by a retired Royal Irish Ranger, which shows off his Saffron kilt and the Prince Charlie jacket, which he had custom made for evening wear. Irish Kilts are also available in various tartans, although nowhere near the extent of the Scottish tartans. One of the oldest registered is the Ulster tartan (found by a farmer in 1956 in County Londonderry) he dug up pieces of the cloth, which the Belfast Museum and Art Gallery dated from between the 1590s to 1650s, its origins are unknown. It is believed to have come from a Scottish pioneer during the Ulster plantation period, when at that time great numbers of Scots came over to Ireland. Many "Irish County" tartans were first designed and produced in 1996 by the House of Edgar, a Scottish company based in Perth. There are also a number of district tartans recently designed by Lochcarron of Scotland. Other generic tartans include the Irish National, St Patrick's, Tara and some family "clan tartans" are available with a few more being created at the moment. 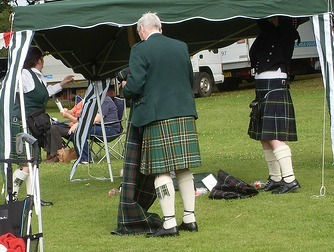 Below you can see a photo of a Gentleman attending the Harpenden Highland Games, he is wearing the Irish National tartan. His day wear outfit also consists of a green Argyle jacket which compliments his kilt beautifully. Fitzpatrick, Murphy, Sullivan and O'Brien are some of the more common examples of family tartans. Only three tartans can be identified as being strictly Irish. Tara was first seen around 1880 and was originally called Murphy. Clodagh was first seen around 1971 there is uncertainty as to its designer, and as I mentioned earlier the Ulster tartan dates back to around 1590 to 1650. So as you can see the Irish Kilt owes much to the authentic Scottish kilt, both in terms of its heritage and indeed the fact that most Irish tartan is copied from Scottish designs. Also the cloth is almost always produced by Scottish manufacturers in Scotland. As I mentioned earlier apart from saffron, the other popular colour for a solid coloured irish kilt is green. 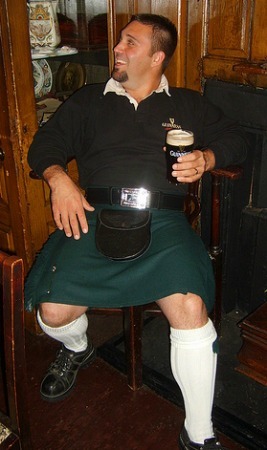 Below you can see a photo of a green kilt being worn by a gentleman who is sitting in the bard's chair, in the Globe Inn, Dumfries, Scotland. When you sit in the chair you must either recite a Burns poem, or buy a round of drinks for everyone in the pub. It is a rare occurrence to see an Irishman wearing a Kilt on the streets of Ireland. the vast majority of these wear tartan particularly in the North. Whereas the military pipe bands wear almost exclusively the solid saffron coloured kilt. And the other occasion is the Irish wedding, where the wearing of the kilt is becoming extremely popular, as it is indeed all over the world.